I was driving around northern Michigan today and noticed some of the leaves starting to change color. Then I realized that with the first frost date rapidly approaching, it was time to think about protecting my garden. Plants such as basil and peppers won’t tolerate temperatures below 50 degrees Fahrenheit let alone a frost. I suddenly felt the urgent need to harvest everything before it was too late. 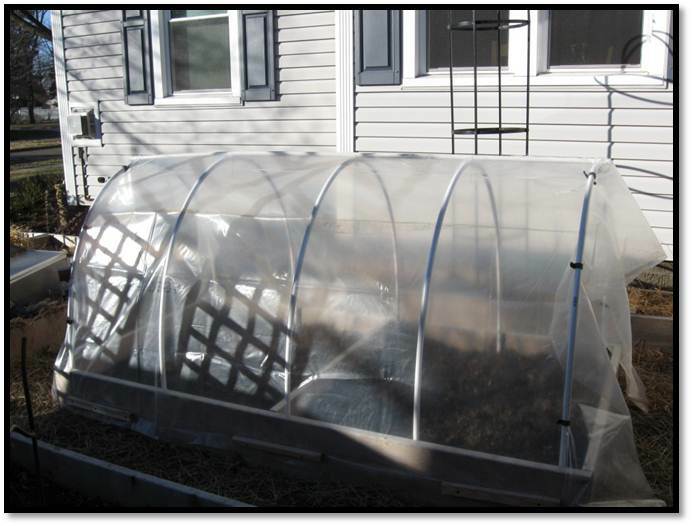 You can extend your growing season long into the fall, maybe into winter in a small unheated greenhouse or cold frame for some crops such as carrots, beets, spinach and arugula. Remember how early spring came? I got so tired of covering and uncovering plants. Hot, cold, hot cold. Well, nighttime temperatures are what you need to pay close attention to now, and the covering and uncovering is about to start again. If it is going to dip down below that magic 50 degrees, protect your warm season vegetables like tomatoes which can tolerate an occasional dip, but then you will start to notice how the fruits stop maturing and they aren’t turning red. Best to pick them and make some fried green tomatoes. 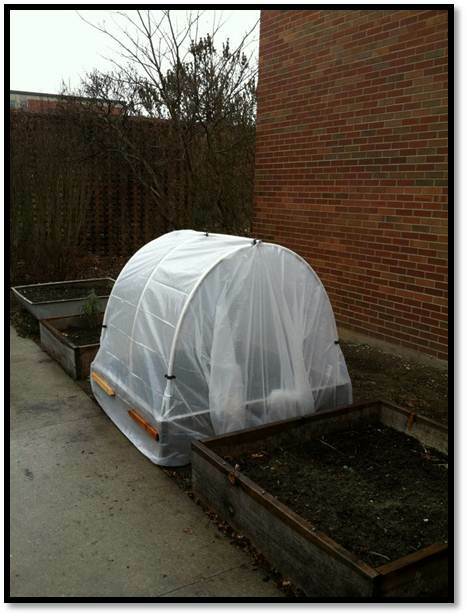 If you want to seriously continue to garden and save what you can, you can build a simple cold frame. WARNING!!! You can now cook your cool season crops on a sunny day. So not only do you need to keep them warm at night, you need to keep them cool on a sunny day. For now, protect with newspaper or lightweight fabric such as a frost cloth which is available from Johnny’s Selected Seeds. 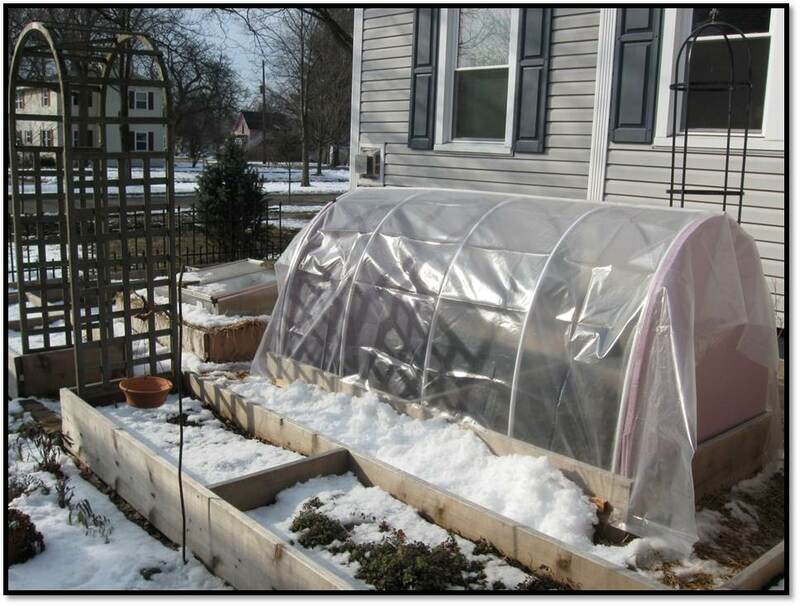 Protect this way on these occasional frosty nights, and prepare for colder temperatures by building a simple cold frame like I did here. I cut 1/2 inch PVC pipes 10 feet long. Since my beds are raised it was easy to push them into the ground on one side. The bed that I am working on is 4 feet by 8 feet. I have equally spaced 5 PVC pipes (you only see part of it here). I bent the PVC around and pushed into the ground on the opposite side of the bed. I secured the PVC to the inside of the raised bed using this galvanized piece. Then I used zip ties to secure an 8 foot pipe to the top. I would recommend adding a screw to prevent it from sliding down the sides. Cover with poly. 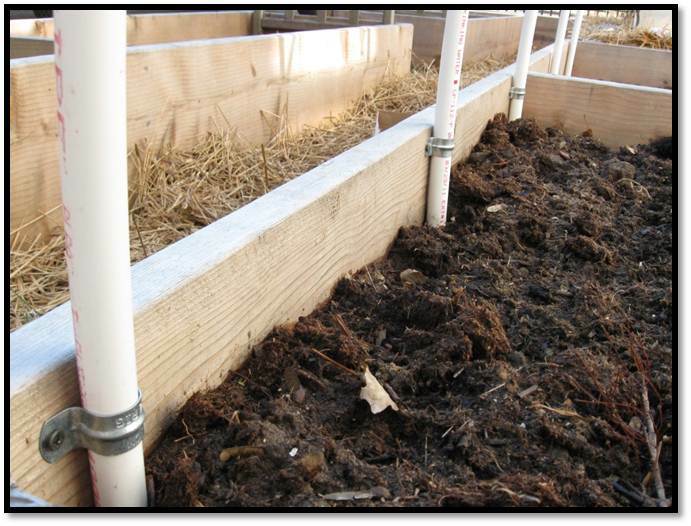 Here I used a horticultural grade poly that I had left over from a greenhouse we built at our farm. 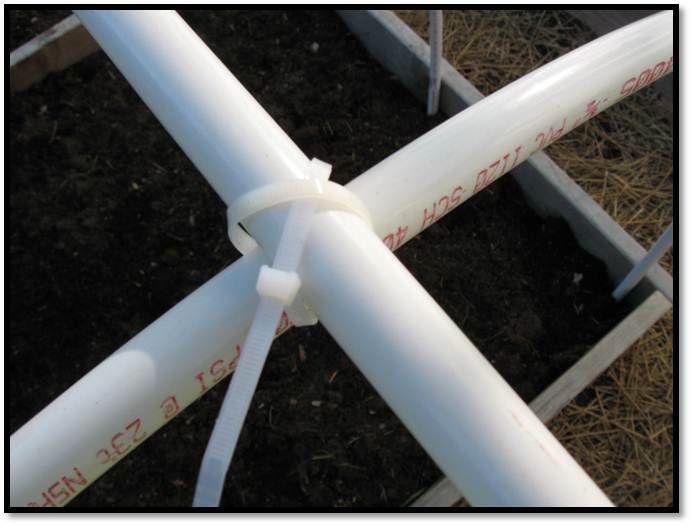 You can buy this at greenhouse supply companies or catalogs like Farm-Tek. More light penetrates, which is important for plant growth and development. Notice how transparent it is. This was an inexpensive alternative using painters plastic from the hardware. For finishing touches, you can use scrap pieces of wood screwed to the bed frame to secure the poly at the bottoms. I used pink foam insulation pieces for the ends to make it easier to remove on sunny days to prevent the temperatures from getting too high. 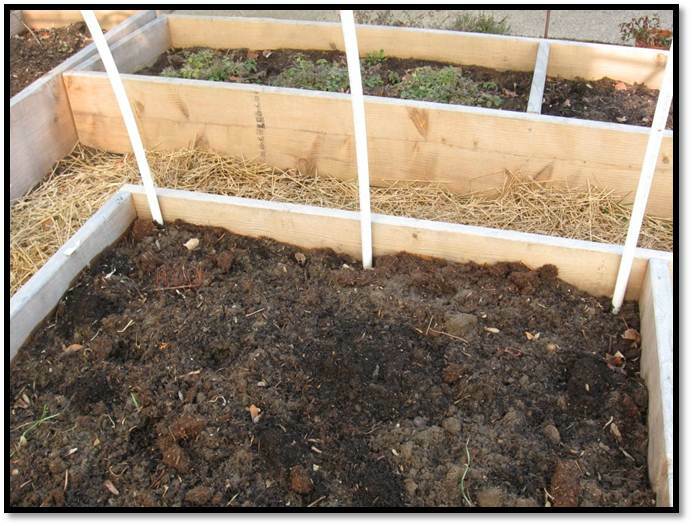 This was the simplest and most inexpensive way that I came up with to make a cold frame. There are many other options to explore whether you want to protect your crops, extend your season, or get a jump on next year. Click on the Grow Veg link to the right, or below on the links to go to Amazon for my favorite books to learn more. 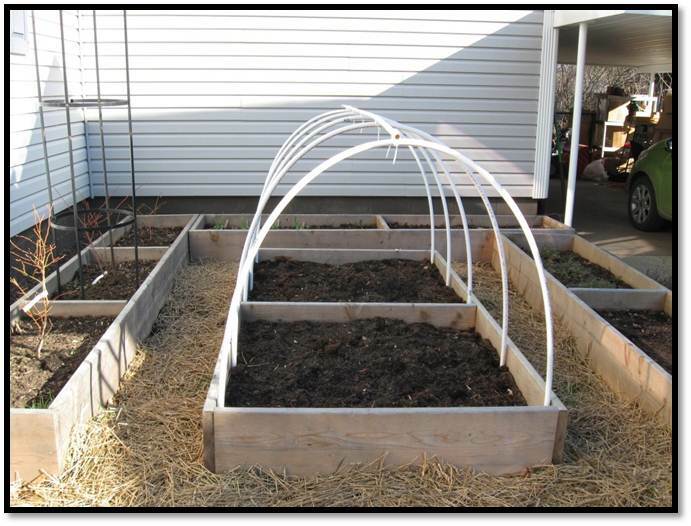 Or the last link to a Juwel Cold Frame like the one you see in the background of the above picture. 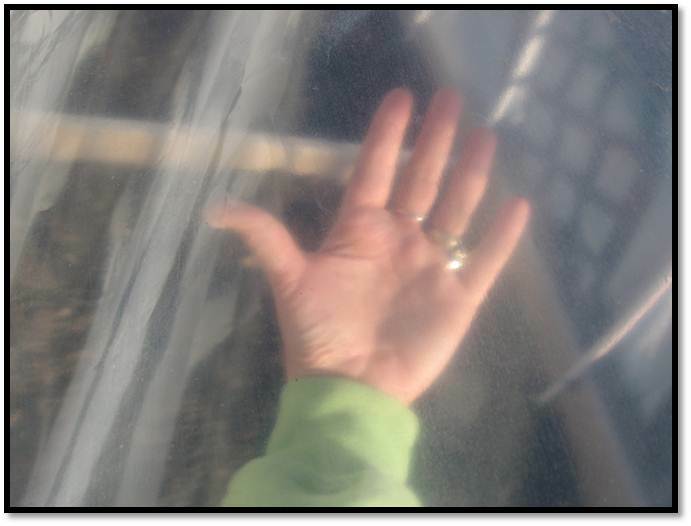 This is one of my favorite cold frames. Just ignore the snow for now. We still have a lot of time before that gets here.